It has been a long while since the Holy AoY Podcast Trinity were able to come together and review a movie and a show in one episode (actually this might be THE ONLY TIME EVER!) We are once united with our overly quiet podcast co-host Josh, as we get to discuss the most recent Angry Video Game Nerd: The Movie being released online, and give our feedback on the moral misgivings of dumbass internet forum debates about Black Lagoon. (0:00 – 49:27) – A Non-Anime Movie Review: The Angry Video Game Nerd: The Movie: The trinity was needed to discuss the lifetime project of James Rolfe and his angry endeavors of reviewing old video games on the internet, which then lead him to achieve the ultimate goal of turning all that hard work into a movie, which is a lot of hard work. So, like everyone else on the internet, we wanted to give our say on his hard work over the past few years. Of course before we get into any of that, we decide to rant about water issues in the West, the deep rooted forum stupidity behind Toonzone.net (aka, Zeonic becoming a Class A Cyber Criminal one lame post at a time), which then leads us to talking about the film. We decided to approach the film with us talking about the parts we liked (aka some Spoilers you know), and really reviewing the character of The Nerd and his evolution throughout the years on the internet. We also discuss how we first got into The Nerd, which in turn gets us into our roots a little on how we got to know each other online. Dare I say a podcast origins episode might turn up one day? Well, you’ll just have to wait and see about that. (49:27 – 52:30) Podcast Promos: With Alpha Counter making the funding goal on their Indiegogo page, we figure we owe it to them to play a promo for them. Dave and Joel seem to be releasing more episodes recently than they have in the past few months; because with JoJo’s and Destiny out in force, they are there too get on that beat. Speaking of releases, The Daily Anime Podcast decided to recently release their review of the To Terra movie, which was just Jeff talking about the film for 20 odd minutes, since I know he read the manga for a while. (52:30 – 1:45:34) The Toonzone Debacle: Black Lagoon Review: Due to the dismay of one particular internet forums opinions (keep reading past the post on the link if you dare), we unite the trinity once more to discuss the recent end of the airing of Black Lagoon on Toonami. Our opinions are mixed on this show, as Zeonic believes that it might be the greatest show to air on Toonami in its entire history, and believes anyone who opposes that idea is a “pansy female reproductive organ.”Jonn on the other hand is not all in alignment to Zeonic Toonami prophetic enlightened views, and Josh just cares about how many BEEPS the show got on TV. We decide to not spoil too much on the show itself; and use the flames of war, cast by a Toonzone Mod unbeliever, to discuss the human, psychological and moral viewpoints of the world in Black Lagoon. Maybe we are giving this show too much credit, but then again, maybe not enough (only because deep down, Zeonic believes Black Lagoon is the best modern day anime equivalent to a 1990’s Manga UK dub.) Care to weigh in your opinion listeners? This also ends with us discussing Zeonic panel plans for BanzaiCon, how we successfully trolled ToonRadio, and much more. Convention Note: If anyone is going to BanzaiCon in a couple of weeks, you have a chance to see Zeonic continue to spew his anime nerd knowledge upon the masses of Naruto headband wearing, Hetalia flag waving, Titan slaying anime nerds that will be present. On Saturday from 6 to 7pm, Zeonic will show his Robot Anime Openings of the 1980’s; which will showcase openings to mecha anime, and even some that made it to the states. Then on Saturday from Midnight to 2am is the cream de la cream to what all panels want to aspire to be, and that is the “WHAT THE HECK?” MOMENTS IN ANIME: THREE TIMES THE MISCHARMED!! It is essentially the closest thing BanzaiCon has to an Anime Hell at this point, and people must know THE TRUTH behind what anime is really about. This entry was posted on 09/29/2014 by zeonicfreak. It was filed under Anime, Convention Coverage, Movies, Other, Reviews, Video Games and was tagged with Angel Cop, Angry Video Game Nerd, BanzaiCon, Black Lagoon, James Rolfe, Keith Apicary, KISS, Movie, Toon Radio, Toonzone. Thanks man. I think you can tell, were not gonna stop any time soon. *hit the wrong button mid-sentence. Heh, congratulations on having a podcast that has lasted longer than a year and longer than any other podcast you guys have done. 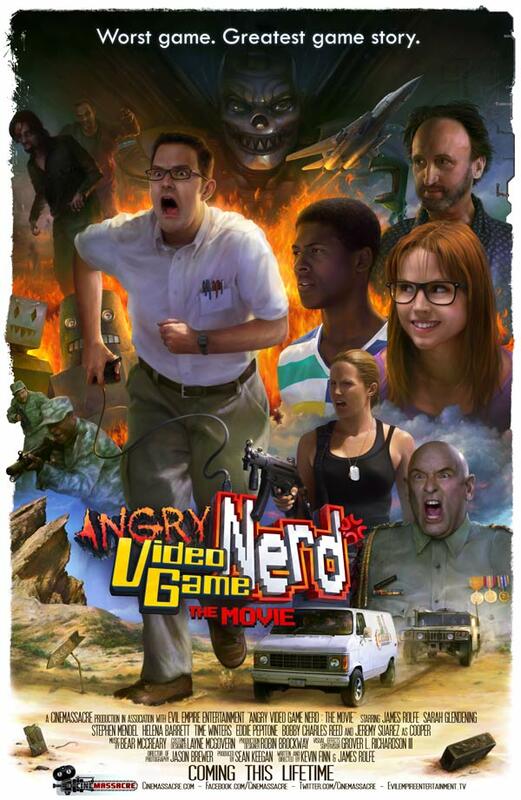 I still haven’t seen the AVGN movie but I kinda want to check it out sometime. I didn’t really get into watching AVGN’s material until about two years ago, because I kinda wrote it off at face value as being one of THOSE That Guy With The Glasses kind of things. I was wrong when I started watching his backlog. Really liked his videos where he kinda started taking them a bit seriously and had less of The Nerd foul language comedy. Black Lagoon is/was pretty great. I’m definitely about that kind of anime and super glad it got exposure through Toonami. I appreciate the thanks man. Yea with us not dealing with certain people from previous podcasts in terms of demands, personal issues and the sort, we have been able to keep this going without any unwanted stress. Yea AVGN for me was around the time that TGWTG was starting to get big on the internet. As time went on, you can see which site was able to be more profitable in terms of creativity and popularity. Yea people tried to mimic the Nerd in the past, but they didn’t last long on the internet. And with TGWTG, those original members are slowly dying off and leaving the site to do other things with their lives. Yea, im happy to enjoy Black Lagoon on TV, and I stand by my statements on I made on the podcast about it being the best show to air on Toonami.